Capital Development Authority (CDA) would shortly introduce a double-decker bus service to facilitate picnickers of the capital after inaugurating mini tourist train on Saturday. 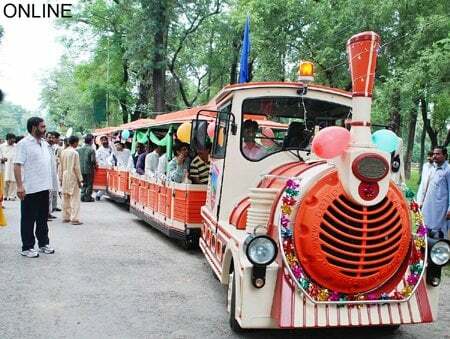 ‘The tourist train is an attraction for the visitors in the federal capital. We are also planning to launch double-decker bus,”’ said CDA Chairman Imtiaz Inayat Elahi talking to media on the occasion. CDA chairman said the project is a brainchild of tourist division that has been established to promote tourism activities in Islamabad that would also enrich the commercial activities in the city. The Italian-made train would travel from Rose and Jasmine Garden and will move around different picnic points including Kashmir Highway, National Monument, Zero Point Interchange, Faisal Mosque, Marghazar Zoo, Japanese Park, Saidpur Village, Jinnah Super Market, 7th Avenue and Fatima Jinnah Park. The train has cost Rs 36 million and the CDA would charge Rs 200 for adult and Rs 150 for the kids, though it would charge half of the prescribed rates for a month to attract the customers. A special discount will be given to disabled persons. The wheel chair facility will also be available for persons with disability. Special routes have been approved for the train where it would ply on daily basis at speed of around 25 kilometres per hour. The train would stop for around 30 minutes at each picnic point and after completing the round, it would reach final destination; Rose and Jasmine Garden. Special signboards would shortly be installed across the routes to inform visitors where the train would arrive. A security guard would protect the train and people getting aboard would be thoroughly checked. During summer season, the train would ply between 1800 hours to 1900 hours but on Sunday it would be available from 1000 hours to 1130 hours. The train timings in winter season would be 1530 hours to 1630 hours and 1100 hours to 1230 hours on Sunday. The chairman said initially only one train would ply and more such facilities would be added subject to the public response. To make the project a success, the CDA has coordinated with Islamabad Traffic Police and transport authority. During the travel, the visitors would be informed about the locations through a commentary. Besides, an instrumental music will also be arranged at various picnic points to allure the people aboard. projects, CDA has decided not to execute any mega project during fiscal 2011-12 as they usually incur major chunk of the budget. To a question as why the CDA has ignored lower income group by launching Park Enclave, the chairman said the civic body would shortly launch a housing project for the very group.